Research is showing benefits for everything from depression to liver disease. Is it just the caffeine? Remember when people (and their doctors) used to worry that coffee would harm their hearts, give them ulcers, and make them overly nervous? In excess, coffee, and more particularly, caffeine, can cause problems. But the fretting about two or three cups a day, or even more, is fading as study results suggestive of health benefits from coffee keep on coming in. In 2011, researchers reported findings that coffee drinking is associated with a lower risk of depression among women, a lower risk of lethal prostate cancer among men, and a lower risk of stroke among men and women. Go back a little further, and you'll come across reports of possible (it's not a done deal) protective effects against everything from Parkinson's disease to diabetes to some types of cancer (see sidebar below). Caffeine has been studied more than any other ingredient in coffee, and it tends to get credit if the body part benefited is the brain. But coffee contains literally a thousand different substances, and some of the lesser lights are thought to be responsible for healthful effects in other parts of the body. Some studies show caffeinated and decaffeinated coffee as having the same effect, which suggests that something else in coffee is involved. It gets complicated, though. Caffeine and some of these other substances in coffee seem to have their good and bad sides, and coffee's overall effect may depend on how much they cancel each other out. Human and animal studies show hints of protection. Some preliminary evidence suggests activity against beta-amyloid plaque that may have a causative role in Alzheimer's. Studies suggest a lower risk for some cancers (endometrial, aggressive prostate, estrogen-negative breast), but not others (esophageal). Antioxidant and anti-inflammatory substances could be responsible for possible anticancer activity. Effects on insulin and blood sugar levels that would promote diabetes seem to be temporary. Regular use is associated with lower risk, and high intake (3–6 cups a day) seems to have a greater effect. Protection may come from increases in the hormone adiponectin and other factors that affect insulin and blood sugar levels. Coffee drinking increases some factors (homocysteine) associated with higher risk. But moderate consumption (1–3 cups a day) has been linked to a small decrease in risk. The evidence for a possible protective effect is stronger for women. Coffee drinking is associated with lower levels of enzymes that indicate liver damage and inflammation. Coffee may improve response to some treatments for hepatitis C. Findings suggest some protection against liver cancer. Cafestol and kahweol, substances found in unfiltered coffee, may be responsible for liver benefits. Studies show a moderate (25%) decrease in risk for coffee drinkers. The effect is less in women. Research has found evidence of activity in the part of the brain affected by Parkinson's. Moderate consumption (3–4 cups a day) is associated with lower risk. But chance of a stroke may increase immediately after intake, particularly among infrequent consumers. Caffeine: Good for the brain, bad for other parts? Caffeine is the most commonly consumed psychoactive drug in the world, and some of its behavioral effects (such as arousal) may resemble those produced by cocaine, amphetamines, and other stimulants. Coffee consumption accounts for about 75% of the adult intake of caffeine in the United States, although that might be changing among younger adults with the growing popularity of energy drinks. The caffeine content of coffee varies greatly, depending on the beans, how they're roasted, and other factors, but the average for an 8-ounce cup is about 100 milligrams (mg). Tea has about half as much caffeine as coffee. Decaffeinated coffee has some caffeine, but the 2 to 4 mg in an 8-ounce cup is a smidgen compared with the caffeinated version. The lethal dose of caffeine is about 10 grams, which is equivalent to the amount of caffeine in 100 cups of coffee. Caffeine gets absorbed in the stomach and small intestine and then distributed throughout the body, including the brain. The amount circulating in the blood peaks 30 to 45 minutes after it's ingested and only small amounts are around eight to 10 hours later. 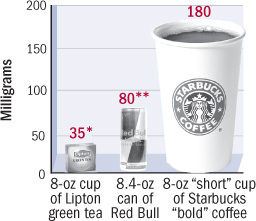 In between, the amount circulating declines as caffeine gets metabolized in the liver. Tobacco and marijuana accelerate caffeine metabolism, which reduces the time caffeine circulates in the body. Oral contraceptives slow it down, so they have the opposite effect. Researchers have identified genes that influence a person's natural risk of caffeine metabolism, which might explain why some people are exquisitely sensitive to caffeine while others are not. Caffeine probably has multiple targets in the brain, but the main one seems to be adenosine receptors. Adenosine is a brain chemical that dampens brain activity. By hogging adenosine's receptors, caffeine sets off a chain of events that affects the activity of dopamine, another important brain chemical, and the areas of the brain involved in arousal, pleasure, and thinking. A part of the brain affected by Parkinson's disease, called the striatum, has many adenosine receptors; by docking on them, caffeine seems to have some protective effects. Outside the brain, caffeine can be a performance enhancer, boosting the strength of muscle contraction and offsetting some of the physiological and psychological effects of physical exertion. But, especially in the short term, it also has negative effects, which include raising blood pressure, making arteries stiffer, and increasing levels of homocysteine, insulin, and possibly cholesterol. Habitual use may cause some of these effects to wear off. For some conditions, though, coffee may have some benefit despite, rather than because of, caffeine. Coffee drinkers concerned about cholesterol weren't happy about some early study results showing that coffee seems to increase cholesterol levels, and "bad" LDL cholesterol levels in particular. But upon closer inspection, the bad news turned out to be not so bad, because the cholesterol-raising effect seems to be limited to coffee that hasn't been filtered, which includes Turkish coffee, coffee brewed in a French press, and the boiled coffee consumed in Scandinavia. The cholesterol-raising ingredients in coffee are oily substances called diterpenes, and the two main types in coffee are cafestol (pronounced CAF-es-tol) and kahweol (pronounced KAH-we-awl). They are present either as oily droplets or in the grounds floating in the coffee. But a paper filter traps most of the cafestol and kahweol, so coffee that's been filtered probably has little, if any, effect on cholesterol levels. The best evidence is for paper filters, but an interesting study published in 2011 showed that filtering methods used in Singapore (the so-called sock method, which uses a cotton-nylon cloth) and India (metal mesh) were also effective at trapping cafestol. Espresso contains more cafestol and kahweol than paper-filtered coffee, but because it is consumed in smaller amounts, it may not have much of an effect on people's LDL level. There is a twist to this aspect of the coffee story, because cafestol and kahweol may also have some health benefits that are lost when they're filtered out. The research is in the preliminary stages, but cafestol and kahweol could have some anticancer effects and be good for the liver. Explanations for the association between coffee consumption and lower rates of heart disease and diabetes often point to chlorogenic acid and other obscure antioxidant substances as the responsible parties. Antioxidants are substances that sop up reactive molecules before they have a chance to harm sensitive tissue like the lining of blood vessels. Chlorogenic acid was probably the main antioxidant in your cup of coffee this morning. Some experiments have shown that it may also inhibit absorption of glucose in the digestive system and even out insulin levels. Chlorogenic acid might be another coffee ingredient with a split personality. Along with caffeine, it seems to push up levels of homocysteine, an amino acid that has been associated with artery-clogging atherosclerosis. Coffee isn't a great source of vitamins and minerals, but as a plant-based drink, it contains some, and a few that we should be getting more of. Let's start with magnesium. A cup of coffee contains about 7 mg, which is a drop in the daily-requirement bucket (420 mg for men, 320 mg for women). But because we don't eat enough fruit, vegetables, and whole grains, the average American's intake falls about 100 mg short of the daily goal. A cup of coffee or two can help close that gap a little bit. Potassium can offset some of the negative consequences of sodium. At about 116 mg per cup, coffee's contribution toward the 4,700 mg of the potassium that we're supposed to get daily is a widow's mite, but it's something. A cup of coffee also has small amounts of niacin (0.5 mg) and choline (6.2 mg). A health drink? Not quite. It is one thing to say that coffee may be good for you; it's another to say it's so good for you that drinking it should be recommended. And we're not there yet. All of the favorable studies and all of the seemingly healthful ingredients in coffee are good news for coffee drinkers. They can relax and enjoy their habit. And people who don't drink coffee can find plenty of other things to do to help keep themselves healthy.